We make conference calling easy, but in case you have any questions about our teleconference meetings below are a few answers to common questions from our clients across Canada and the US. How quickly can I get an account? Sign up for your FREE Trial now and we'll contact you within 30 minutes to setup your teleconference calling account immediately. You'll receive an email notification when it's ready. How quickly can I setup a meeting? Once you have your account, phone meetings can be setup in minutes. Once you have registered for your FREE trial, you can set up your first call meeting immediately. What's included with my account? Features to help your team communicate and collaborate better. Live assistance by our trained Canadian team. 24/7 access from anywhere around the globe. Secure conferencing with excellent voice quality. Toll-free international conference calling from 60+ countries. Conference call recording and storage. Easy to use web pages for reviewing and sharing recordings. What happens after my 300 minutes? Our services are Pay-As-You-Go, so you'll be billed at regular rates but you can continue to use the conference call service until the next billing date. How many people can dial into the conference? With Vesta Teleconferencing, you can have as many conference calling participants in your meetings as you need. Just let us know in advance how many more than 50 lines will be needed. Do I need any apps to use the service? We'll help you get started quickly and easily using your landline telephone. Can I use my landline or cell phone to connect? Absolutely. Take a look at our Teleconferencing Solutions for more information. 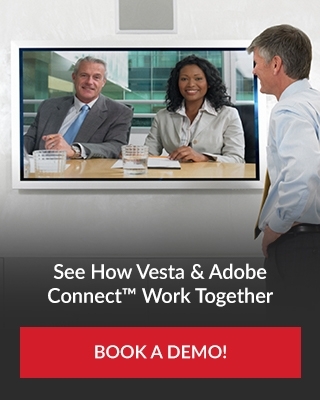 With Vesta Teleconferencing, you can have as many conference participants as you need. Can I set up meetings after hours? Teleconference meetings can be setup any time from your phone with dial-ins from anywhere and a toll-free number for 60+ countries. How do guests and clients join our calls? Just provide them your free included Toll-Free 800 number and they can call in from national and over 60+ countries internationally. Can I share call audio after the meeting? Log into your dashboard at anytime to access your recorded calls and share them with whom you please.